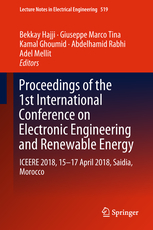 The proceedings present a selection of refereed papers presented at the 1st International Conference on Electronic Engineering and Renewable Energy (ICEERE 2018) held during 15-17 April 2018, Saidi, Morocco. The contributions from electrical engineers and experts highlight key issues and developments essential to the multifaceted field of electrical engineering systems and seek to address multidisciplinary challenges in Information and Communication Technologies. The book has a special focus on energy challenges for developing the Euro-Mediterranean regions through new renewable energy technologies in the agricultural and rural areas. The book is intended for academia, including graduate students, experienced researchers and industrial practitioners working in the fields of Electronic Engineering and Renewable Energy.